Last year I was flat out crazy for the camo fashion trend. For instance, I ended up with not one, but two pairs of camo skinnies. Who needs TWO pairs of camo skinny jeans? This girl does. Haha! In my defense, they&apos;re different shades of green. That totally makes it acceptable right? Thankfully, camo is still hot hot hot this year and not only will I be able to bust out last season&apos;s camo skinnies for fall, but I&apos;ve been inspired to pick up another camo piece or two! When I went back to school shopping for my little guy this year, I couldn&apos;t help but pick up several camo thingamabobs. His camo pants collection is bigger than mine now. Camo sweats, cargos and jeans ended up in my shopping cart, as did a camo henley and I have my eye on a camo hoodie that I just may go back for. What can I say? I&apos;m camo obsessed. Since the last few weeks have been all about shopping for the kiddos, I&apos;m ready to focus on my own back to school wardrobe. Us mamas need to look good too! I definitely want to snag a camo bag and shoes for the upcoming season. The only question is do I want a backpack or a clutch? Should I go for flats or heels? Or maybe I should just get all four? Ok, ok...That may be a case of camo overkill. 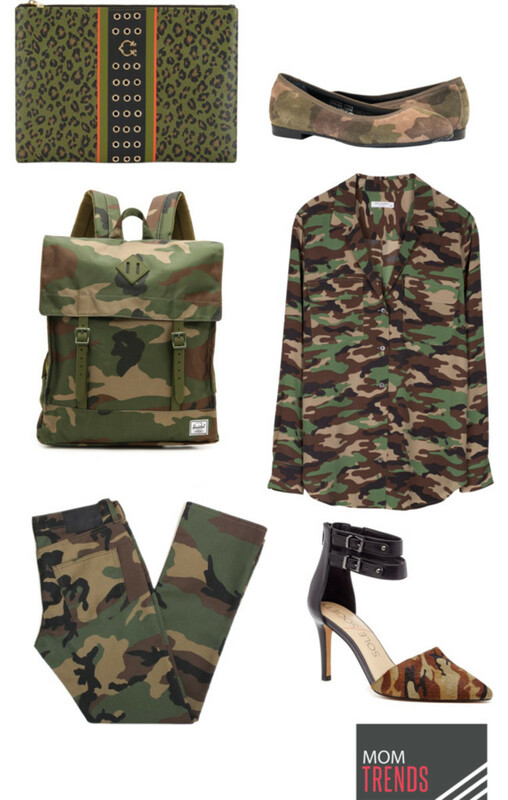 So, do any of these camo goodies strike your fancy? If you buy nothing else, I highly suggest you consider camo skinnies. You wouldn&apos;t believe how many different ways I&apos;ve worn mine! They&apos;re incredibly versatile and can totally work like a neutral! And they can be dressed up AND down easily too. I&apos;ve worn them with a sweatshirt and turned right around and rocked them with a lace peplum top the next day!